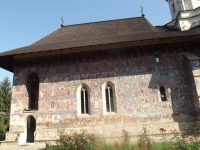 The Churches of Moldavia are Byzantine churches with painted exterior walls. They were built between ca. 1487 and 1532, as a protective barrier against the Muslim Ottoman conquerors from the East. Church of St George of the former Voronet Monastery. This is Romania's best WHS - without any doubt. I spent 1.5 days visiting six of these churches: Arbore, Humor, Moldovita, Suceava, Voronet, Sucevita. They lie scattered around the beautiful region of Bucovina in the Northeast of Romania. The churches all have a lot in common, but are distinctive enough to merit visiting several of them. If I had to choose between them, I would say that Voronet and Sucevita are the most rewarding ones to visit. Voronet has the most impressive exterior frescoes of them all, while Sucevita is a large and well-maintained fortified monastery complex. I find it strange that Sucevita was only this year added to the then 7 locations that comprise this WHS, but maybe there was a technical reason for this. This is a popular tourist region in Romania, so you surely will not be alone here. Most of the churches charge entry fees (plus additional camera fees), and sometimes you have to pay the parking too. The nuns sell postcards, booklets and trinkets. Tour buses from Germany, France and Belgium also know how to find the major churches. But no matter, I found myself staring and enjoying the frescoes over and over again. There are so many details to discover, from historical (the fall of Constantinople) to biblical. During the course of a single day I managed to visit all eight of the listed churches, thanks to the advice and help I received. As it was a Sunday all the churches were open, and many of them well populated. Only at Patrauti was I alone, but even there the priest came and opened the church for me. All the churches were worthy of a visit, but I thought Voronet and Moldovita the most colourful. For anyone else visiting these churches I would recommend seeking out Lucy at Hilde's Residence, a renowned guest house in Gura Humorului. A few years ago (2009) I have traveled to Bucovina with my family and we wanted to see all the churches included in UNESCO World Heritage List. My mother insisted that not all worth a visit just because she saw them and was disappointed because the poor care and destructions. I decided I have to see all them so we did it and the visit was amazing. One of the oldest ones is Arbore, a very small church from Suceava country. It is dedicated to Saint John the Baptist. The name in the UNESCO list is Painted Churches of Northern Moldavia (there are 8 such places and I will describe all of them in time). The church from Arbore was built in 1503 by boyar Luca Arbore, one of the right hands of Ștefan cel Mare (Stephan the Great), the Prince of Moldavia between 1457 and 1504. The construction of the church was completed in about 5 months. Its exterior paintings date from 1541 and were made by Dragoº Coman and took about 4 decades. The outside paintings on the western wall are the best preserved, as opposed to those on the northern facade, which suffered extensive weather-related damage. This damage arose mostly because the church roof was plundered by marauding Cossack troops and melted in order to make bullets (the original roof was made of lead). Inside painting depicts Luca Arbore and his family offering the church to God through the intercession of Saint John the Baptist. Also inside are the tombs of Luca Arbore and his family. Luca Arbore died in 1523 by decapitation at the order of the Stephan IV (son of Bogdan III; also called ªtefãniþã) (he was the grandnephew of Stephen the Great). Luca Arbore was the regent of Stephan IV until 1523. From 2005 there are no religious rituals. We visited all 8 (including Sucevita, which was added in 2010 shortly after we returned to the US). It was an amazing experience! We had an English-speaking guide with a car who knew the region very well and could never have found some of the monasteries without him. While seeing Voronet, Moldovita and Humor was inspiring, the most special for us were Patrauti, where we met the Priest and had a personal tour, along with hearing his rich descriptions of the paintings -- he is a scholar with extensive knowledge about the paintings and has published on the subject, and Probota, where the level of restoration is at the highest level (no doubt from the Japanese endowment). Going to Probota was well worth the additional drive, though it was very difficult to get to really (down rural, dirt, heavily pot-holed roads). Arbore was a different sort of place as well, noting that it is currently not in use. The woman who is in charge of watching over it though was very candid and told us much about the church and the community. Of course, speaking with anyone really at any of the monasteries would have been difficult at best without a translator. It was interesting how little tourist infrastructure there was, and it reminds you that these are living religious sites that are currently in use by the community as churches, in most cases, and their WHS label does not suddenly turn them into museum monuments. With most of the monasteries we were often the only tourists on the premises, while the few other people on site were either part of the religious order, were there to pray or on pilgrimage. They were all beautiful, awe-inspiring and well worth the time and energy to visit. I hope to go again someday. I visited in September 2010 in two of the churches in Moldovita and Sucevita monasteries. Like the other review says Sucevita was big and very well maintained but somehow I liked Moldovita more. The paintings were in much better conditition in Sucevita but atmosphere in the smaller and less touristic Moldovita was much nicer (maybe because the nuns in Sucevita were little rude). 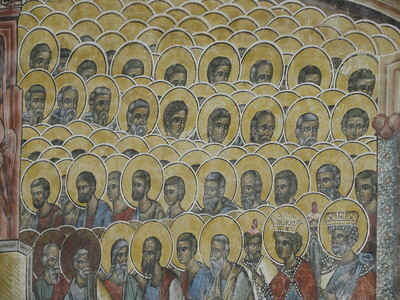 But the amazing paintings of these churches are definitely worth of seeing, they're full of little details. Romania has inscribed 3 different “sets” of churches on its WHS list. Each set exists in a separate geographical area of the country and each is distinguished by a different architectural feature - Wooden, Fortified and Painted. We have only visited the latter 2 and, on the basis of their uniqueness, beauty and situation would place the Painted Churches among the highest category of WHS in Europe. A visit to them is really a wonderful experience. The churches are mainly, but not all, set within “Monasteries” (though, as these all seemed to be “staffed” by Nuns when we were there, I wonder whether “Nunnery” might not be a more correct description!) and are situated in the NE province of Southern Bucovina near the Ukrainian border. There are 7 main ones. We spent a day driving between them and, although distances are small, public transport is limited and having a car is really a “must”. Each monastery is set in beautiful countryside – rolling green wooded mountains with flower filled pastures. Each church is decorated inside and out but it is the external frescoes which are the most amazing. The walls are completely covered with vivid representations of bible stories many of them graphic in their “realism” (pictures of the martyrdom of saints or of the Last Judgement for instance) Each church tends to have a predominant colour – blue, green or red etc. The paintings date from the 15th and 16th centuries but they seem more medieval in concept than that dating would imply. Dubbed as another WHS: Voronet - "Sistine Chapel of the East"
95 Community Members have visited.